Chapter 32: Olmec Site Alignments. "The earth is round, like an orange." This continues the investigation into the Mesoamerican calendar started in a previous chapter. My main purpose originally was to check site alignments among early Olmec sites and locations in the Valley of Mexico. I wanted to see if the earlier inclination of the Earth's axis could be detected from solstitial alignments. But I soon realized that although there were many sunset alignments repeated from site to site, there were no solstitial alignments. What could be inferred from some of the later alignments which were found was the suggestion of a religious crisis experienced by the people of Mesoamerica in the 7th century BC. This is similar to what happened elsewhere in the world at the same time. See Appendix C for specific data and calculations. Malmstrom's book is a vast resource, but it contains errors in the promotion of a particular idea. Malmstrom's idea is that the 260-day calendar (called the Tzolkin) was first established at Izapa, where the Sun overpasses the site on August 13. It does not; I will discuss this further below. Malmstrom thus points out "August 13" alignment at other sites, although most are for August 12, and many are confused with alignments for the date of April 19th. But August 12 alignments were certainly found. But what I found in addition, were alignments to the setting (or rising) zenithal sun for six additional dates for almost all the sites, at some sites selected for the condition of a 30-degree axial inclination, at other sites for 23.5 degrees. Only two sites (Cuicuilco and Tlapacoya) mixed alignment under different axial conditions. All the site alignments pointed to giant mountains and the largest volcanoes in this region of Mexico, often hundreds of miles away. I considered 11 volcanoes and large mountains. The exceptions were the use of an alignment defined by the major axis of the site itself (two locations for which I had data). After consideration of other sources from the Eastern Mediterranean, I was able to tie these dates to the catastrophic events of 3114 BC (August 12), 2349 BC (September 8), 1492 BC (April 19), 747 BC (February 28), and 685 BC (four dates). The dates turn out to represent the end of the "Era of the Gods" in 3114 BC (a retrocalculated date, the actual is 3147 BC), the removal of the Absu in 2349 BC and the so-called flood of Noah as the culmination of the Pleiades three days later, the Earth shocks of 1492 BC and of 747 BC, plus a distribution of 4 dates which can be assigned to the plasmoid from Jupiter in 685 BC. The initiation and arrival of the plasmoid (in 685 BC) represents a series of events which seemed to have caused some confusion among the people of Central Mexico. There is little agreement on which date or which event constituted the end of the era in 685 BC. The four dates are used in a nearly equal measure. It might also be suggested, consonant with the philosophy of Mesoamerica, that an era did not end at all in 685 BC. Considering that there are 365 days in the calendar year, and that the Sun rises and sets at the same horizon locations twice each year, there are still some 182 days, and 182 locations along the horizon, which could have been selected. To have alignments consistently show up mostly on 4 dates only (plus three for 685 BC), is not a random distribution. Alignments for matching calendar dates vary at most by only 1/3rd of a degree between calculated and observed values from site to site. Thus, for almost all of the ceremonial sites, only 4 horizon locations were selected from among 182 possibilities. It is also clear that almost all sites picked either to align their important "era-ending dates" to an axial inclination of 30 degrees or an axial inclination of 23.5 degrees. Only a few sites mixed alignment for different axial conditions as convenient to the mountains or volcanoes which could be used. At La Venta, which was in use by 685 BC, we see the effort to change the major mountain alignment corresponding to a sunset for February 28 for an axial inclination of 30 degrees, to a new value for an axial inclination of 23.5 degrees by rebuilding the site with its axis aligned 8 degrees west of north. The perpendicular to the new site axis points to the new sunset location for February 28, 747 BC. Additionally, all the Olmec ceremonial centers built after 1400 and 1200 BC were oriented so that the Sun would travel directly over the site and then set at a prominent mountain twice per year. These alignments were selected as a signature for the site location: having the sun set in a volcano on the day it would pass directly overhead at the site, or signaling some important event of the past, like the date (actually, the horizon location) of the end of a previous era. Both of these are obvious from an inspection of alignments between the sites and mountains for all the Mesoamerican ceremonial centers which I looked at. 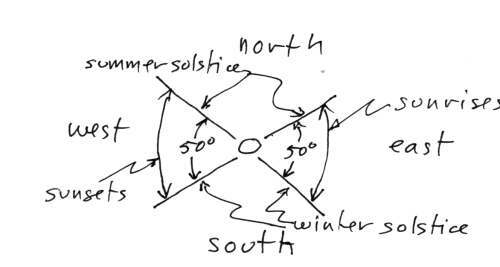 I originally looked for solstitial alignments based on the work of Vincent H. Malmstrom, who, in Cycles of the Sun, Mysteries of the Moon (1997), had set out to demonstrate solar alignments of ceremonial centers of Central Mexico. The data collected by Malmstrom was meant to show both solstice alignments and "August 13" alignments (where the Sun set on August 13th). First, let me present some comments about the apparent need for these orientations, as suggested by Malmstrom. He suggests, curiously, that the alignments arose from a need to "calibrate the calendar." I don't think so. It is just unlikely that giant structures needed to be built to demonstrate over and over again where along the horizon the Sun set in mid-summer. The calendar didn't need calibrating; the Tzolkin calendar just continued to toll off days, one after another, as it had for thousands of years. Two sticks in the ground would demonstrate where the Sun set at the solstice. Additionally, the location along the horizon where the sun set at the solstice of summer (or winter) is the most difficult to pinpoint among all the possible locations where the sun might set throughout the year. What I think should be inferred instead from the sunset and sunrise alignments is that the people of Mesoamerica were attempting to control the Sun's proper course, perhaps since the earliest times, but especially after 1492 BC when it looked like the world had come to an end, causing many long years of a deeply overcast sky, and the length of the year had changed. When the overcast skies cleared, 20 years after 1492 BC, it was noted that, for various critical days in the year, the Sun again set on the proper days of the Tzolkin calendar -- as if the Tzolkin had regulated the sunsets -- even though the solstice sunset had relocated and the year had lengthened. No one paid attention to the location of the solstice sunset or the length of the year. We have to realize that the ceremonial centers of Mesoamerica -- all the sculptures and murals, all the stelae and dedicatory objects -- deal almost exclusively with religion and nothing else. To invoke kings for the Olmecs, or conquests for Teotihuacan cannot be adequately supported. Certainly we see armed men among the depictions, and later tribes actively attempting to control other people by force, but the concepts of kingly leaders are late concepts among the Maya and Aztecs. The leaders were priests who were a privileged elite. The emperor of the Aztecs was known as the "speaker" -- he talked to the Gods on behalf of the people. Teotihuacan never had a standing army. The Classical Era Maya had neither standing armies nor a police force. The armed men, and the wars among the Maya, were used to capture sacrificial victims, for blood was needed to maintain control of the Gods and to sustain creation. Armed men were also used, no doubt, to protect trade expeditions. Trade, initially used to support the priestly elite and the ceremonial centers, was extensive and would soon have supported independent traders as a class. Of course what we know of trade are only the objects which did not degrade with time -- ceramics and stone. But what obviously fostered trade was the enormous surpluses of agricultural products, the same economic force which supported the ceremonial centers. It is thus also likely that the alignments were used to pinpoint the start of an agricultural year -- a New Year celebration -- against the rotating calendars. This can be seen in the activities at the Maya center of Edzna where the celebration of New Year was determined for all of the Maya centers of the Yucatan, by selecting the zenithal passage of the Sun as the significant date. More on this below. A New Year's Day in late summer, anywhere in the region, would divide the agricultural year into the two planting seasons, the maize crop planted in spring was harvested in early summer, and the crop planted in late summer was harvested in fall. The overhead (zenithal) passage of the Sun would happen in early spring, and again in late summer at all locations in the region. What was much more important was to control the path of the Sun, as a sign that the current creation of the world was being maintained by the shamans, by the continued use of the Tzolkin calendar, and by the use of the proper location of ceremonial centers. In a fashion typical of well-documented later Mesoamerican philosophical thinking, mankind was responsible for this, and the ceremonial sites implemented the control over the current creation. This is so entirely different from the attitudes toward the Gods which developed in the Mediterranean region, as to be nearly incomprehensible to Westerners. It should be realized that the Sun was never a God in Mesoamerica, despite what archaeologists and anthropologists might otherwise suggest. References to a Sun-God will inevitably be references to Jupiter, the Midnight Sun. The Sun did not move irregularly; the planetary Gods did. The Sun always looked the same; the planetary Gods trailed feathers, as Venus did, or donned a tri-lobed headdress and took a body shape of an opened crocodile jaw, as Jupiter did, cruised close to Earth in an attempt to destroy creation, as Mars did, or brought flowers to Earth, as Mercury did -- all experienced as late as the 8th and 7th century BC. The Sun was just an object, a part of nature like the wind and the rain, although created by the Gods. The only extant "creation myth" that has come down to us, the Popol Vuh, is clear about this. Sighting the rising or setting of the Sun along the horizon is a topological solution to tracking and controlling the doings of the Sun. The Olmecs were certainly correct to pick this solution after 1440 BC, and were vindicated in 747 BC when the Earth's axis again spun through a circle, and the length of the year changed, and again after another Earth shock in 686 BC and a passing plasmoid in 685 BC. After each of these disturbances the Sun quickly returned to its correct setting location -- but of course not on the same date of an equivalent Gregorian calendar. But the calendar date did not matter. It was the sunset location that was important. With this the shamans of the Olmecs would repeatedly demonstrate that they indeed did have control over the Sun, for the location of the sunset of an overhead (zenithal) passage of the Sun remained virtually the same even when the orbit of the Earth changed and the year changed (as in 1492 BC and 747 BC), or the seasons fell into disorder (as after 685 BC) -- or, at least, so they claimed. A number of claims of the efficacy of the Tzolkin calendar show up in Book 10 of the Chilam Balam, which I have pointed out earlier. But then, unlike the changes which had happened in 1492 BC and 747 BC, something different happened. In 685 BC Venus attacked the Sun, chased away the stars at the North Pole, and dislocated all the other stars. But the Sun, after its overhead passage at any of the ceremonial sites, again set at the correct location of the horizon in the following year as in the previous times. The Sun definitely had left its path in the sky, but it was corrected, as the Chilam Balam reads, "within the time of Katun 3-Ahau." The following were the changes over a period of 60 years or more, from 747 BC to sometime after 685 BC. First, the year lengthened in 747 BC. This happened, as we know from Babylonian records and the Olmec Long Count, on February 28th, 747 BC (February 26th after nightfall for Babylon, February 28th from the Roman calendar). The inclination of the Earth's polar axis remained at 30 degrees to the normal of the orbit at this time. The Olmecs selected the date of the change to a longer year (the completion of the previous era), as February 28, Gregorian, as a New Year celebration. This remained in use in Guatemala to today and was in use among the Aztecs. The later change in the axial angle in 685 BC caused some sites to simply change the alignment of the site axis, as at La Venta. La Venta was initially aligned to a mountain located 11 degrees west of north -- by the choice of its location -- which celebrated February 28 while the Earth's axial alignment was still at 30 degrees. After 685 BC La Venta was rebuilt to have its long axis at 8 degrees west of north, thus aligning the site at a right angle to the new horizon sunset location for February 28th. Many later ceremonial centers (after 600 BC) followed this practice of a right angle alignment to an important sunset or sunrise. The dates of the equinoxes and solstices would change with our calendar methods, but a change in the length of the year would not change the horizon location of sunrise and sunset at the equinox -- directly at the east and west cardinal points. Other sunset locations falling within a few months of the equinox changed, but often only imperceptibly -- a small fraction of a degree. It is the location of the solstice sunrise and sunset which would have changed radically. However, solstice alignments were apparently never used, and never recorded. Second, when in 685 BC Venus and Mercury blazed like suns, the inclination of the rotational axis of the Earth started to change. The actual date that Venus and Mercury started to blaze is June 15th (Gregorian). Third, the nova condition of Venus and Mercury was brought to a halt by a plasmoid bolt from Jupiter in late summer, arriving at the Sun on July 25th, Gregorian. This date is clear from the actual time interval mentioned in the Chilam Balam and from many site alignments which celebrate July 26 as New Year's Day. The Chilam Balam claims that the Sun went off its path, that is, it did not set at the expected horizon location, for 40 days after June 15th. This was due to the ongoing change in the inclination of the Earth's rotational axis during that time period. Forty days after June 15th is July 25th. Jupiter had started to brighten or blaze, like Venus and Mercury had done, but at a later date, apparently on July 9th. The massive plasma output by the Sun would have taken about 5 to 10 days to reach Jupiter. Because of its huge size, Jupiter did not form a visible coma (and other features) for some time. A switch from dark mode to glow mode would have been sudden, and would have been noticed. This happened on July 9th. On July 14th Jupiter released a return lightning bolt at the Sun. This was seen and recorded worldwide. The changes in 685 BC were the cause of extensive confusion. The problem would be immaterial from our perspective, but was of the greatest theological concern to Mesoamerica. The exact date that the previous creation had ended needed to be determined. The possibilities included July 9th, when Jupiter first erupted, understood as rising from death, July 14th, when a plasmoid was released from Jupiter, understood as a decision by Jupiter to stop Mars from further interference with Earth, and July 25th, when the initial plasmoid landed at the Sun (although assumed to have been destined for Mars), which was seen as an extension of the current creation -- rather than an end of one creation and the start of a new creation. It is obvious that a variety of new theologies would arise from these events. They include the resurrection of the Sun God, Jupiter, as had happened once before, in 2349 BC. There is also the concept of the self-sacrifice by a deity (Venus or Mercury) in order to save the world from destruction. The varied interpretations are found in the extensive information from Maya archaeology and documents like the Chilam Balam, the Popol Vuh, and many early retellings and reports by the missionaries. The initial and most visible physical response involved the realignment of some sites to new horizon locations and the use of these alignments for new sites. A few sites were aligned or realigned to July 9th. This is likely the day Jupiter first assumed a large coma again in response to the continuous coronal mass ejections from the Sun. A few sites use the date of July 14th, the day when Jupiter released a plasmoid lightning bolt in the direction of the Sun. This date can be derived from the Chilam Balam. Most sites accepted July 25th, the day the plasmoid landed at the Sun, for this certainly stopped the blazing of Venus and Mercury, and in effect closed an era. The events were commemorated in a number of ways by the Olmecs and the people of the Valley of Mexico. The Olmecs, as well as the Maya (who had adopted the Olmec theology by AD 100), celebrated a New Year's Day on July 26th, Gregorian (the day after July 25th). In the case of both the city of Teotihuacan and Maya Edzna the locations of the ceremonial center were selected to coincide with the zenithal passage of the Sun over the site for the equivalent horizon location of the Gregorian date of July 25th. The zenithal passage of the Sun over a site on July 25th would only happen at a latitude of 19.5 degrees north. Vincent Malmstrom suggested in 1979 that a computational method could be used to find the day of creation (August 13) by counting 52 days into the future from the summer solstice. After 685 BC the solstice occurred on June 21. Fifty-two days later is August 12. This is based on the apparent numerological importance of the value of "52" in Mesoamerica, and despite the fact that the solstice is very difficult to determine. It would, thinks he, be a reason to note the solstice. But counting 40 days (two Uinal months) backward from the fall equinox of September 21 would achieve the same results, and be much more accurate. And then again, if you have a calendar, who needs to count days? At any rate, Malmstrom is correct in suggesting that August 13th (actually August 12th) was one of the standard alignments used by many new sites. However, I think the date of August 12 represents a retrocalculated date for the event of 3147 BC (completion of the "first creation"), retrocalculated to 3114 BC by the Olmecs of La Venta after 747 BC, using the Long Count. As will be seen from some of the alignments, many sites opted to duplicating the dates and horizon locations of previous eras at times correct to the axial alignment of the Earth during the previous eras, at other times translated to the proper horizon locations of the current era. Fourth, after 685 BC, the inclination of the Earth's polar axis changed from 30 degrees to the normal of the orbit to 23.5 degrees. The Chilam Balam reads, "After three heaps of years it [the Sun] will come back into place in Katun 3-Ahau." The "three heaps" of years are three "bundles" of 5, thus 15 years, but counted inclusively -- thus actually 14 years. The "14 years" are 14 Tzolkin cycles of 260 days (about ten solar years), not years of 365.24 days. This is correct, that is, after 14 Tzolkin cycles the Sun set again at the same horizon location as earlier, although on a different date on our calendar. This is the clearest indication that there was a change in the axial inclination of the Earth. If there had been no change, it would have taken 20 Tzolkin years to return to the same Tzolkin day name and number instead of 14. But under any conditions it would have taken some years for a number of diverse opinions to develop on what the changes meant, and how they should be represented. We start to see changes in alignments in the Central Mesoamerican region by about 600 BC. The Maya, on the fringe of this region, seem to have accepted a number of interpretations, including the celebration of New Year on July 26 (adopted from Teotihuacan in Mexico), and a new sunset for August 12. How did the Sun find its way back to a proper alignment after 685 BC? It did not, at least, not in our way of understanding this. What happened over the course of the 40 days is that, along with the change in the inclination of the Earth's axis, the horizon locations of the summer and winter solstices moved from about 32 degrees north and south of east and west to about 25 degrees north and south of east and west. But the seasonal calendar day of the solstices (and the equinoxes) also moved. They moved, in all, by 15 days. During other parts of the year, the locations where the Sun set for particular calendar days also changed. If any of these sunsets corresponded to significant calendar days before 685 BC, they were now incorrect. But for a people who considered the year as consisting of a series of sunsets at differing horizon locations, the calendar days did not really matter. For one, the Sun would set at the same horizon location -- before and after 685 BC -- on the equinoxes. Another demonstration of stability was that the horizon location of the day of a zenithal passage of the Sun over a site remained almost the same, even though the expected day on the Tzolkin calendar changed (as well as the day of the seasonal calendar). For all the sites at these latitudes, the angle of an alignment of zenithal sunsets occurred again, after the axial change, at within 0.3 degrees of the old alignment. The zenithal sunset locations were least affected by the changes of 685 BC. In a way, this might have been a screen which hid the changes at other dates and horizon locations. We have to consider the political implications of the Chilam Balam statement that "the Sun returned within three heaps of years." For the shamans of the established Olmec ceremonial centers it was important to assert that they had not lost control. The statement of the Chilam Balam involves some hyperbole found in the original books of history from which the Chilam Balam was copied. I am suggesting this, because, even allowing for a number of ways in which the Sun could "return," the statement is incorrect -- the path of the Sun through the sky simply was not be the same before and after the event of 685 BC. It is true that the important zenithal sunsets of the sites all remained almost exactly the same, but the sunsets of important "era ending" dates all changed, since these were seasonal calendar dates further displaced from the equinoxes. But the definitions of what "return" meant could be made to fit the facts. For the Olmecs the Sun's "return" was measured as its setting location along the horizon, not the day of a seasonal year that this happened. Thus when the day of a zenithal sunset again coincided with the same day as earlier after 14 Tzolkin years, rather than the expected 20 Tzolkin cycles, the statement could be made that the Sun had returned. The fact that in the months close to the solstices the Sun definitely set at a different horizon location from before 685 BC seemed not to have mattered. The difference in the horizon location of the solstice sunsets had, in fact, changed by seven degrees. To us this would be an important consideration. Obviously, we should be able to determine if the locations of the alignments before 685 BC were different from today's locations. This is actually easy to do. At 20 degrees latitude, in the Veracruz region, the Sun sets at the summer solstice at 25.1 degrees north of west -- under the current condition of an axial inclination of 23.5 degrees. At the earlier axial inclination of 30 degrees, the Sun would set at 32.1 degrees north of west. The difference is seven degrees. This should be clearly seen in some of the oldest Olmec sites. If, that is, the solstice location was of any significance in the philosophy of the Olmecs. Unfortunately, it was not. Nowhere in Mesoamerica are solstices ever celebrated. As noted above, I started this investigation with information from Vincent Malmstrom's book Cycles of the Sun, Mysteries of the Moon, which suggested solstice alignments for all the ceremonial sites in Central America. And here is the crux of my investigation and the reason I pursued this investigation: If Malmstrom, in his investigations, had found alignments which differed by 7 degrees from his expectations, I am sure he would have discarded this information out of hand. For this reason I wanted to recheck all the data on alignments that he had developed. In this process I checked alignments against every notable mountain and volcano in the Veracruz coastal region and in the Central Valley of Mexico, even if the mountains were not visible from a site. This has revealed some interesting alignments, but, despite Malmstrom's claims, only one suspected solstitial alignment among some seventy alignments. I did find some "August 13" alignments (which Malmstrom also promotes), but most often as August 12. Accuracy is a problem. I should point out that in the 182 days that it takes the Sun to travel from the locations of the winter solstice to the summer solstice, the Sun only travels 50 degrees along the horizon from south to north (today). Thus the setting location of the Sun moves only 1/4 degree per day on average, which is equivalent to half the width of the Sun. As the solstices are approached, the Sun moves only imperceptibly. 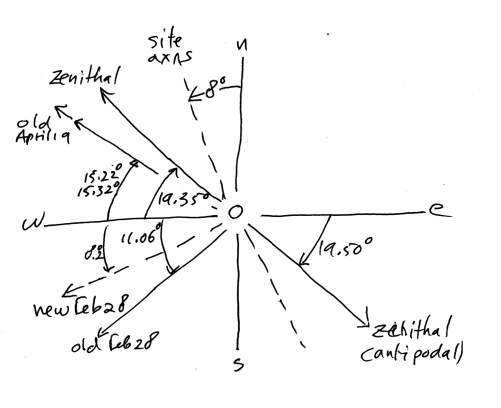 On the other hand, Malmstrom also describes the shadow gnomon used to determine the exact day, July 25, that the Sun passes overhead at the ceremonial site of Edzna in the Yucatan, at a latitude of 19 degrees and 40 minutes north. The following day, July 26, was celebrated as New Year's Day by the Maya. Because the method of finding this date involves a circular pillar gnomon, and not a setting Sun alignment along the horizon, it is dead accurate. Malmstrom states that Edzna is the only Maya ceremonial center at this latitude. The contemporaneous city of Teotihuacan in the Valley of Mexico, however, is also at the latitude of 19 degrees and 40 minutes. 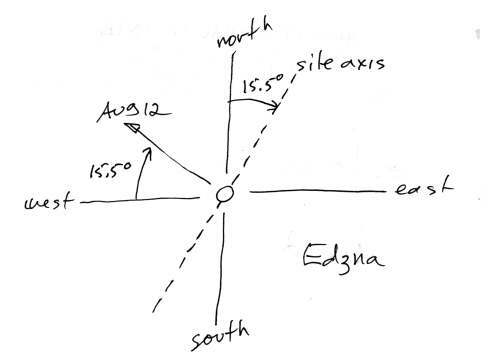 The ceremonial center of Edzna is also aligned to the setting of the Sun on August 13th (actually, August 12th) with the use of an off-north axial alignment of the site. These two alignments (July 25, August 12) can also be found at Teotihuacan, the largest ceremonial center in the Americas, and one of the three largest cities in the world at its time, which may have had much more influence in determining observation of the calendar among the Maya than Edzna. A second problem lies in differentiating some "old alignments" from "new alignments" when numeric values are close. Luckily, most sites use a number of important alignments, so that single questionable alignments can be identified as to which period they belong. Last, dating is somewhat of a problem. Archaeologists will support the earliest date as an indication of site occupation, which may have nothing to do with monumental construction at the sites. I have used iconography for estimates on dates of construction at Olmec La Venta, where the imagery and alignments of the construction of the ceremonial site (which is visible today) clearly dates the latest construction to after 685 BC, although C-14 dates suggest occupancy of the area by 900 BC. For most other sites I have used available archaeological dates. This at times allows determining the inclination of a site to adopting one set of alignments over another. Only in a few instances do occupation dates go against a sensible timetable for the adoption of newer alignments. I'll indicate these. All the archaeological dates for founding, construction, and destruction of major sites match the formal expectations for the occupancy of ceremonial sites based on the concept of the "may" first developed by Munro Edmonson and expanded on in Chapter 33, "The day of Kan."
The following is a summary of sites, dates, and alignments. In looking over the following data, keep in mind that for locations from 14.5 degrees latitude through 20 degrees latitude the summer solstice alignments (sunrise or sunset) vary only from 24.3 to 25.1 degrees north of east or west. August 13 alignments would vary from 15.2 to 15.7 degrees north of east or west. Alignments are shown for both the current arrangement of the skies (23.5-degree inclination), and the previous arrangement, before 685 BC (30-degree inclination of the polar axis). Note also that, for example, if the Sun rises some number of degrees north of east, it will set at the same number of degrees north of west -- within one quarter to one third of a degree. Last, there are numerous clear instances of antipodal alignments. An antipodal alignment is one which is an equal number of degrees above or below the east-west cardinal direction, and would point to a sunset or sunrise location in the opposite direction, across the site. To ease the task of reading the following data, let me propose the important dates and horizon locations which we are looking for (or which have been discovered). The angles shown below are for a sunrise or sunset as so-many degrees north or south of east or west. That is, south of the east-west direction in fall and winter, north of the east-west line in spring and summer. Angles of the list below are approximate, since they vary somewhat with the latitude of the site. The angles are shown for both an axial inclination of 30 degrees and for 23.5 degrees. The overhead (zenithal) passage of the Sun is also listed below. The dates are all shown as Gregorian equivalent dates. Reasoning for the selection of certain dates is detailed further below. At this point we have a great number of instances which can be identified as marking the culmination of the Pleiades. The sequence should point to a history of the ceremonial centers. But of course old forms can be reinstituted, and established forms can be used for a long time beyond their currency. The codification of the "Day of the Dead" by Teotihuacan in circa AD 200 or 400 lasted to AD 1550. So the list should be used carefully. Below a list of Pleiades culminations is reproduced. Infrequently, the angle for some one event might be confused with another event. For example, the angle of 15.3 degrees (April 19, before 685 BC) is close (0.4 degrees) to the angle of 14.9 degrees (August 12, after 685 BC). We should be able to select the appropriate event from the age of the site, or the use of other alignments. The angle of sunset for zenithal passage at any of the sites, by the way, remains almost exactly the same before and after 685 BC. Mostly the dates are developed in this chapter, in the text further below. But let me explain some of them beforehand. The following is data for 13 Olmec and Valley of Mexico sites only. This date first shows up at La Venta (for an axial inclination of 30 degrees) and then at Teotihuacan. September 8, 2349 BC -- The date celebrates the completion of the era ending in 2349 BC, the fall of the Absu (the flood of Noah) and the end of the "third creation" of the Olmecs and Maya -- when the Pleiades first became visible. This date represents the reappearance of Jupiter on September 8, two and a half days after the arrival of the plasmoid from Venus (two days after the actual date of the autumnal equinox on September 6). The remembrance of 2349 BC is celebrated worldwide (as the "Day of the Dead") with the culmination of the Pleiades, although the calendar dates have changed. The culmination of the Pleiades moved later into the year after 685 BC, at first to about October 8th because of the change in the equatorial, and then further into the fall because of the precession of the equinox. By 600 BC the Pleiades culminated on October 10th. Precession makes horizon angles which may have celebrated this day difficult to find, because they are dependent on the date at which they were selected, and thus depend on the year that a ceremonial center was built. However, many sites can be identified with a later culmination date of the Pleiades which had apparently been codified to a set calendar date, like the Christian All Saints and All Souls days. These dates are found, not from sunsets, but from the actual locations of the setting of the Pleiades in the west. The last date (October 20 - 21), set in AD 200 to AD 400, was still in use in the 16th century AD. Because the setting angle of the Pleiades varies with latitude as well as with the year, I have not explicitly identified these in the data below, except those which corresponded to the era of 685 BC to 600 BC and for AD 200 to AD 400. There may thus be others, although I do not think so. These two sets show up repeatedly. April 19, 1492 BC -- The date represents the Exodus of Moses. The calendar date is, first of all, from sources in the book of Exodus, but has been modified (from "the 14th of Aviv") because I am not following, for example, Velikovsky's supposition that the month of Aviv started at the vernal equinox. I am here following the suggestion of the Olmecs, that the date of the Earth shock in 1492 BC happened (or completed) a few days later. There are some 12 alignments to support this. This alignment first appears at San Lorenzo, which was founded after 1450 BC, and abandoned by 900 BC. February 28, 747 BC -- This date, representing the change in the length of the year in 747 BC, is firmly established from considerations of the Long Count, and it is also established with the first Olmec sites of La Venta and Tres Zapotes. Especially at La Venta it is significant that the alignment was revised after 685 BC to correspond to the new axial inclination of the Earth. February 28th alignments occur 9 times. July 25, 685 BC -- This date, the arrival of a plasmoid from Jupiter at the Sun, was established from the Maya New Year celebration (of July 26th) based on the observance of a zenithal passage of the Sun at Edzna and Teotihuacan. This is a firm date also. July 25 alignments occur 7 times. July 14, 685 BC -- This represents the suggested date that the plasmoid from Jupiter was released. The date of July 14 can also be derived from information of Book 10 of the Chilam Balam. The selection suggests a possible "day of Kan" associated with the end of an era -- the delivery of the plasmoid on July 25th. The concept of the "day of Kan" is discussed in the following chapter. The date shows up four times among Northern Olmec sites. July 9, 685 BC -- This represents the date that Jupiter may have initially expanded in size. This date is based solely on the fact that it first shows up at Tres Zapotes, recurs 4 times elsewhere, and represents an adequate interval for Jupiter to have been seen with overhead plasma plumes and a lower trifurcated body -- so that these shapes could enter Olmec iconography. This date is not well supported because it would seem to represent a "beginning" rather than a "completion" of an event. This date would have to be understood as the completion of the period of death of Jupiter. The analysis of site alignments will first look at two sites remote from the region which I investigated, Izapa in southern Mexico on the Pacific coast near Guatemala and Edzna in the eastern flatlands of the Yucatan. Izapa (14.90 degrees north latitude; 92.18 degrees west longitude), at the Guatemalan border of Mexico, is archaeologically dated at 600 BC to 100 BC. One of the busiest sites along the Pacific coast, with some 130 pyramid mounds and 89 stelae. Malmstrom assumes that the date for an earlier village, south of Izapa and closer to the Pacific coast, dated to 1400 BC, is applicable. The problem with this statement is that it is wrong. The alignments identified by Malmstrom are incorrect. The real problem may be that this conjecture has been copied and transmitted from one document to another, including a few by archaeologists, without the simplest verification. Malmstrom slightly hedged the observation of his earliest article, "Izapa: Cultural Heart of the Olmecs?" in the Proceedings of the Association of American Geographers (1976), so that in his 1979 book Cycles of the Sun, Mysteries of the Moon he simply asserts that the Sun passed over Izapa on August 13. The quotes below are from the 1976 article and the 1979 book. "Thus, the southward transit of the vertical sun takes place at this latitude on August 12 - 13, and its northward passage occurs on the following April 30 - May 1." To have an important reason for devising an arcane 260-day calendar Malmstrom suggests that the planting season for corn was based on the 260-day interval after August 13th. It is not. The 260-day span in the fall is the secondary planting season. The primary season for growing corn was the shorter time span of 105 days from April 30 to August 13. "Thus, it was possible for a priest standing atop the main pyramid at Izapa not only to calibrate accurately the length of the sacred 260-day almanac, but also, by counting the number of days which elapsed between consecutive sunrises over the highest mountain in Central America, the true length of the tropical year as well." What is here suggested is that these stone-age people were so intellectually handicapped that they could not count the days in a year. And when they did count 260 days from one zenithal passage to the next, they devised a system so arcane and so esoteric as to be nearly useless. The following year, as the 260-day Tzolkin falls totally out of sync with actual calendar days, another calendar is superimposed, the 365-day Haab. "For someone accustomed to think in terms of entities rather than fractions, it was no more logical to conceptualize a part of a day than it was a part of a fish, a cacao bean, or a quetzal feather. It therefore must have seemed obvious that the day could not be counted until it was completed, that is, at sunset. In any event, this is the pattern of thought which Mesoamericans were to employ in all their subsequent mathematical computations." Missing here is any recognition that all the tribes of the Americas, from Alaska to Patagonia, used only two tenses to conceptualize the world: actions that were ongoing, and actions that were completed. As with many other languages, there is no future tense. To suggest that the initiation of the Tzolkin calendar caused all the Mesoamerican tribes to adopt the concept of "completion" is just absurd. Malmstrom writes, "... the site of Izapa, as noted above, is oriented to the volcano Tacana, the second highest mountain in Central America." It is not. It may be the second highest mountain, but the central axis of the site is displaced 16 degrees east of north. The sight-line to Tacana, on the other hand, is 20.33 degrees east of north. The difference is equal to two hand spans of fingers at arm's length. Not close at all. Malmstrom writes, "the author noted that the region's highest peak, the volcano Tajumulco (4,220 meters), lies at an azimuth of 65 degrees from the ceremonial center. This azimuthal relationship is precisely that of the rising sun at the summer solstice." It is not. My calculation has the volcano Tajumulco at an azimuth of 64.43 degrees, which is 25.57 degrees north of east. Solstice sunrise is at 24.36 degrees. This is off by more than a degree (two fingers wide at arm's length), a serious matter for a solstice, where the locations of sunrise and sunset move only by small fractions of a degree along the horizon. Being off by a degree means that the solstice date could be off by about 10 days. Of course there is a problem with determining alignments due to the overall design of the site. Since it is mostly laid out along a SSW by NNE axis, there will be large differences in alignments if taken from different locations along this axis. We might suggest that there was a "center" of the monuments from which alignments were determined, but we have no idea of what part of the site was held to be the religious center in antiquity. Jenkins was determining a winter solstice sunrise over the end of this ballcourt (in area "F" of Izapa). Here we have an independent voice suggesting that the sunrise is off by "a degree or two" from expectations. "The cone of Volcan Tajumulco, the highest mountain in Central America, marks the sunrise position at the summer solstice (June 22) as seen from Izapa." It does not, as I have already noted. This did not keep Malmstrom from finding many other alignments for August 13th. "... the author has found that more than forty of the oldest Mesoamerican ceremonial centers were oriented in just such a manner, including the classic Olmec sites of San Lorenzo and La Venta (paper in press)." They were not. At San Lorenzo an alignment for August 13 does not exist at all. There are two alignments, at 15.05 degrees south of east and 15.36 south of west, for the axial inclination of 30 degrees, which could be confused with an August 12 alignment of 15.46 degrees south of east, at the axial inclination of 23.5 degrees. The occupation of San Lorenzo ended 300 years before the Earth's axis changed to 23.5 degrees, and 200 years before La Venta, where in 747 BC the Long Count was developed which allowed retrocalculations to be made. Similarly at La Venta where two coaxial alignments near 15 degrees also point to April 19th under the condition of the Earth's axis of rotation being at 30 degrees. There are Long Count dates in use at Monte Albans by 600 BC. But nothing at Izapa. Although Izapa is the busiest site for monuments, stelae, "altars," and "thrones," there are no inscribed dates, and no texts. Izapa is totally illiterate. It is a cartoon version of sacred history. It has been suggested that it was a trader's version of dedicatory monuments, installed after a good year or a profitable season. I should also note that an identical horizon location of sunrise (and sunset) on August 13 and, 260 days later, on April 30, is true everywhere. It is also true everywhere that any two days on the calendar which are spaced equally before and after the summer solstice will produce the same rising and setting locations at the horizon. What, then, is significant for Izapa? Only the site axis and the zenithal sunrise are significant. Both point to August 11th. There are no other significant alignments here. This suggests it is so because of the great distance from the Valley of Mexico, which appears to be the epicenter of the "August 12 alignment" philosophy after 600 BC. This would thus suggest that the site of Izapa was selected for various religious purposes, probably even before 685 BC, but not because the 260-day Tzolkin and 365-day Haab calendars were created at this location. What is being presented at Izapa is August 11 as the start of creation, based on a date retrocalculated since the establishment of the Long Count in 747 BC, which allowed this to be done, and using the August 11 version of the Long Count. It is a retrocalculation based, of course, on a year of 365.24 days, not 360 days which was the basis of the Long Count. It is slightly more complex than splitting a fish three ways. Stela 5 at Izapa is likely a representation of the "second creation" ending in 3147 BC, when people are first molded. Chiapas and upland Guatemala is the region where the August 11 version of the Tzolkin is still in use today. 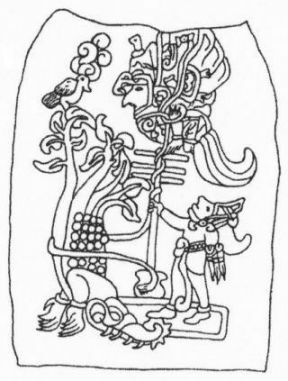 The emphasis on the "creation" is fully expressed in the monuments and carvings at Izapa which depict elements of what will be recorded in the later Popol Vuh. 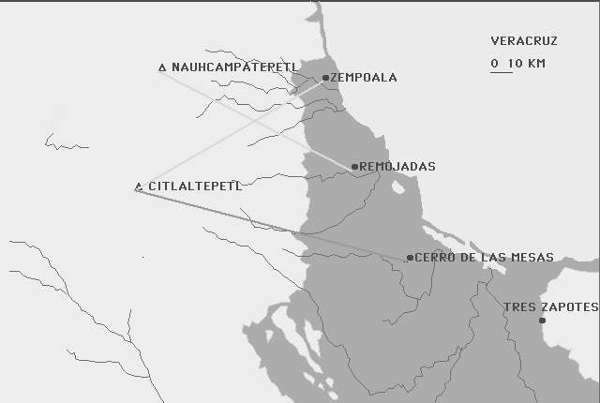 Edzna (19.58 degrees north latitude; 90.25 degrees west longitude) in the Eastern Yucatan, was initially dated at AD 600 to AD 900, but a settlement of 400 BC is currently suggested, with building activity dated to 150 BC, making it contemporaneous with Teotihuacan in the Valley of Mexico. The Sun passes directly overhead on July 25th (89.98 degrees up from the horizon), as it does at Teotihuacan, which is located at the same latitude although a thousand miles (1600 km) west. The main axis of the site is displaced 15.5 degrees east of north. This results in sight lines between structures which mark an "August 13" sunset alignment at 15.5 degrees north of west (15.63 degrees on August 12). There is no solstice alignment. The two alignments are congruent with the suggestion that the religious philosophy of Edzna derived directly from Teotihuacan. The two sites above are "modern" by comparison with some of the Olmec sites to be discussed below. The Olmecs had populated the San Lorenzo area since 1450 BC according to recent C-14 dating. But their most outstanding effort was the production of a calendar which effectively controlled the Gods and sustained the current creation of the world. As I developed in a previous chapter, the 260-day Tzolkin calendar had been in effect since 2349 BC. This was high science, and its effectiveness was demonstrated to other tribes by the prosperity of the Olmecs. In the region of Olmec influence, which extended into the Valley of Mexico, into the Yucatan, across the isthmus to the Pacific and south to Guatemala and Honduras, their religion, their iconography, and their "civilized attitudes" were adopted in imitation, but always localized to regional needs and concerns. Other Gods may have been added to the Olmec pantheon, but the Tzolkin was adopted without alteration, for this was science, not religion, and, like our science, was held to consist of universal truths, even while it remained integrated in the religious philosophy. Like Thucydides, who constantly reminds his readers how the prophetess at Delphi had been correct, the author of Book 10 of the 16th century AD Chilam Balam includes repeated references which go to prove how events had been completed in accord with the cycles of the Tzolkin. Thus when the alignments of the oldest Olmec site, San Lorenzo, are investigated, it should not be surprising to find that the control over creation extends back into remote antiquity. San Lorenzo (17.66 degrees north latitude; 94.83 degrees west longitude) is inland from the coast in Veracruz and dated as active from 1450 BC to 900 BC. This is thought to be the oldest Olmec site, built on a huge man-made platform, which some think is shaped like a bird facing east. The ceremonial aspects of the site were destroyed in about 900 BC, although people continued to live there and at two nearby locations. The location of San Lorenzo was chosen, in 1450 BC, or some 40 years earlier, as a significant site. It is immediately obvious that in the era before 685 BC the sun passed directly overhead on the equivalent Gregorian day of August 15 and set on that day in the giant-sized volcano Popocatepetl, 267 miles (430 km) to the northeast, the second-highest peak in Mexico -- even though it could not be seen from San Lorenzo. This suggests that the overhead passage of the Sun on a particular day (and its disappearance into a volcano) was a matter of site identity, as we have already seen for Izapa. Since the Sun passes overhead at every location where ceremonial sites were constructed, from Guatemala to the Central Mexican desert, it would seem of no consequence for me to note this. But it becomes significant if the locations of ceremonial sites are selected so that the sunrise or sunset for a zenithal passage of the Sun is aligned so that the Sun sets or rises at some mountain or volcano. In fact, this is the case at almost every one of the sites in Veracruz and in the Valley of Mexico. Malmstrom suggests a solstitial alignment at 25 degrees south of west over the mountain Zempoaltepec. However, Zempoaltepec is 15.36 degrees south of west, measured from the village of Tenochtitlan which is a central part of the San Lorenzo complex. This 15.36-degree angle with Zempoaltepec could have been used by Malmstrom to suggest an "August 13" alignment, but even Malmstrom would have realized that this would have been much too early historically. The "August 13" alignments do not show up anywhere else until after 600 BC. San Lorenzo was abandoned in about 900 BC. The alignment of 15.36 degrees south of west with Zempoaltepec is equivalent to an antipodal sunrise on April 19th, on a backward extended Gregorian equivalent calendar, under the condition of having the axial inclination of the Earth (to the normal of the orbit) at 30 degrees. Similarly the mountain El Chichon makes a complementary angle of 15.05 degrees south of east with San Lorenzo, defining an antipodal sunset for the same day of April 19th, on a backward extended Gregorian equivalent calendar, and also under the condition of having the axial inclination of the Earth at 30 degrees. El Chichon is 1060 meters high and could not be seen from San Lorenzo. Exodus (12:6 and 13:4) reveals that the day and month of the Earth shock of Exodus (in 1492 BC) was the 14th day after the start of the month Aviv, which in turn is the "first" month of the year (Exodus 12:18), supposedly opening on the equinox, with the month started at a new moon. The Earth shock happened, says Velikovsky, based on Biblical and other sources, at midnight, and preceded the Exodus of Moses. Additionally, says Velikovsky, the equinox fell on the day of a new moon. Exodus is not clear on when the first month (Aviv) started. The following can be gleaned from Exodus -- none of which specifically supports what Velikovsky wrote. Exodus 12:2, God tells Moses that this will be the first month of the year (as opposed to the traditional Egyptian start of the year near the fall equinox). Exodus 12:6 speaks of the paschal feast to be performed on the 14th day of the month, "between the evenings." As in Egypt, the day started at nightfall. Exodus 12:18 notes the extent of the seven days of the Passover feast, from the 14th day of "the first month" to the 21st. Velikovsky may have used additional sources, but neither this nor any other text in Exodus supports his claim that this month started at the equinox, except the future location of the paschal feast in the year. It is, in fact, the start of a liturgical year. The civil year still started at the autumnal equinox. Not mentioned by Velikovsky, Exodus 13:4 notes "this day in early spring." This would be the excuse for suggesting that the month of Aviv might have started on the equinox. (Aviv means "spring.") But for Aviv to have started exactly at the spring equinox is unlikely. The 14 days defines a full Moon on a 28-day lunar period. In 1492 BC the period of the Moon changed from 28 days to 30 days. We have here, therefore, a dating glitch. I will accept the date of April 19th used by the Olmecs as reflecting the Earth shock of 1492 BC as accurate. Let me suggest also that the alignments at the site of San Lorenzo had been selected to coincide with the completion of the previous creation. The "creation" event of 1492 BC (or completion of a prior "creation") does not fit well with other notions of "creations." Although the alignments were carried forward with all later ceremonial sites, little seems to have been made of the events of 1492 BC. The end of the previous creation may have been determined by the Earth shock, or by the completion of the subsequent reaction motion of the Earth (which may have been quite long, as I have suggested earlier). It is difficult to gauge what the Olmecs might have considered as the end of a creation. This would in this case seem to add five days to what the rest of the world considered to be the start of the 1492 BC cataclysm. The selection of the day which ends an era (rather than the start) is almost completely certain from the starting date of the Long Count in 747 BC, as well as the dates selected as important for 2349 BC (the "third creation"), and 685 BC (both of which are detailed below). El Chichon is 1060 meters high. This mountain could not be seen. It lies southeast of San Lorenzo. The angle (15.05 degrees south of east) defines an antipodal spring sunset on April 19th (at 15.23 degrees north of west), at the time when the axis of the Earth was at 30 degrees. Cerro Zempoaltepec in the southwest is the 11th highest mountain in Mexico, at 3396 meters. It can be seen in the southwest from any of the San Lorenzo locations. The angle (15.36 degrees south of west) defines an antipodal spring sunrise, which matches the sunset angle made by El Chichon, for April 19th (at 15.23 degrees), at the time when the axis of the Earth was at 30 degrees. The fractional differences in the two angles (0.31 degrees) is very close to the advance the Sun makes between rising and setting at that time of the year (an average of about 0.24 degrees in 12 hours), although admittedly, it is in the wrong sequence. 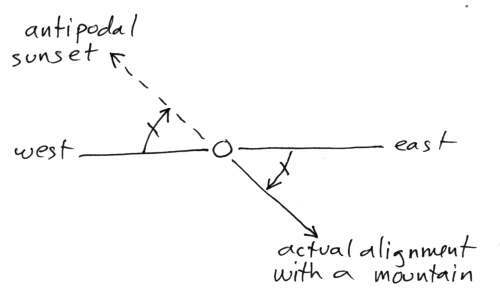 In this analysis I have used "antipodal" as signifying a direction across the site, that is, an angle displaced 180 degrees from the alignment. If, however, antipodal is used in the sense of an angle reflected across the east-west cardinal direction axis, then the 0.31 degree difference is correct in signifying the difference between the horizon sunrise and sunset locations. San Lorenzo predates the disturbances of 747 BC and 685 BC, which were architecturally recognized by ceremonial centers built after 747 BC and after 600 BC. The occupation of the mound of San Lorenzo was chosen to signify the end of the previous creation in 1492 BC. The mountain Popocatepetl could not be seen from Tenochtitlon at San Lorenzo. It is the second highest volcano in Mexico. The mountain Popocatepetl, signaled the day (sunset) that the Sun passes directly overhead at Tenochtitlan, on the Gregorian equivalent day of August 15, with the Earth's axis at 30 degrees. The August 15 sunset horizon location lasted past 685 BC when the axis of the Earth changed to 23.5 degrees. After 685 BC the Sun again rose and set at almost exactly the same horizon locations, but on August 2. Under the condition of having the Earth's axis at 30 degrees, all the Olmec sites at latitudes of 17.7 degrees (San Lorenzo) to 19.4 degrees (Zempoala) will have the Sun pass overhead between Gregorian equivalent dates of August 15 (San Lorenzo) and August 10 (Zempoala). After the axis assumed an inclination of 23.5 degrees, these same Olmec sites will have the Sun pass overhead between Gregorian equivalent dates of August 2 (San Lorenzo) and July 26 (Zempoala). Thus the Sun passed overhead again 13 to 15 days earlier in the year. But in all cases, the Sun, under the new order of the sky, would set again at the same horizon location, to within a small fraction of a degree. In this manner, the Sun -- everywhere -- returned to its former path. In summary, two site alignment aspects can be assigned to San Lorenzo which seem to have some justification, rather than just referring to numerological magic. These two aspects, it turns out, will be true for all the Olmec and Valley of Mexico sites I looked at. Certain: The passage of the Sun directly overhead of the site on two days of the year, August 15 and April 29th (in this case). The alignment with Popocatepetl, 267 miles away, although not visible from San Lorenzo, would signal this date. After the later change in the polar axis of 685 BC, the Sun set again at the same horizon location (within 0.09 degrees) after passing directly over San Lorenzo, but on a different calendar date. 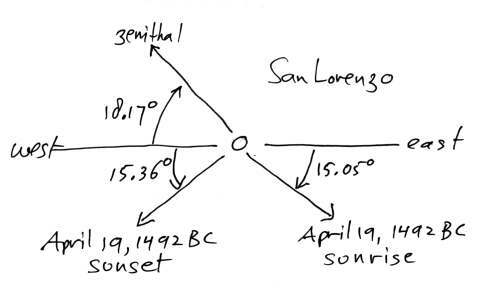 More than a coincidence: The selection of the site at the intersection of sight lines to the sunrise and sunset of the ending date of an era on April 19, 1492 BC. For San Lorenzo the nearby mountains Cerro Zempoaltepec and El Chichon signaled this date. Note that both of these alignments are antipodal. This is the first use of antipodal alignments in the region. Ending date(s) of previous era(s); setting at mountains. There is, at San Lorenzo, no solstitial alignment, either in the current era, or in the previous era. If a solstitial alignment from the era before 685 BC, when the Earth's axis was at 30 degrees, had shown up at San Lorenzo it would have been a sunset at 32 degrees north of west. This certainly would have been evidence that the axial inclination had indeed changed. But nothing like that has been revealed. A word should be said about alignments to mountains and volcanoes which cannot be seen from a site. The Olmecs were not an insular people. They traveled widely, paddling freight canoes around the Yucatan to Honduras, crossed on foot to the Pacific and traveled into Guatemala and further south. There are suggestions that eventually they traded as far north as the Southern United States. They knew the mountains of Central America for they exploited their resources. It took modern archaeologists nearly ten years to find the Mesoamerican source of the jade which appears ubiquitously among ancient artifacts. As such, they must have been comfortable with sight-line navigation, at sea as well as on land, so that it would be easy to determine the location of a mountain even when it was hundreds of miles out of view. A mountain which had disappeared from view could be located from a knowledge of intermediate landmarks. (Any Boy Scout can do this also.) Additionally, once a distant mountain was located against a setting star or an overpassing star, it could be located, even when out of view, for in the tropics the stars deviate only minutely in their setting location at the horizon over the year. Mauricio Obregon, in Beyond the Edge of the Sea (2001), describes navigation in antiquity. The book includes a section on stellar navigation in the tropics, applied to Polynesia. This would also apply to Mesoamerica. He demonstrates how, over the range of tropical latitudes, the rising and setting locations of stars move very little over the course of the year. And, as likely, the zenith location of stars was used. Obregon discusses this for navigation in the Mediterranean. Since the stars do not deviate from their position (unlike the Sun), every port would have a series of stars pass directly overhead which would always be the same, although different stars would do this at different hours of the night, and the sequence would shift throughout the year. Any port could be located from one or more associated stars. Ports could be found longitudinally by sailing to the location of the highest position of these stars in the sky. This would place the ship either directly north or south of the port. After this it would be a matter of sailing north or south under the guidance of the polar stars. But anyone familiar with the travels of the stars in the night sky could have navigated to the port of destination on an angle. In the Odyssey, Homer, as a display of the modernity to come, has the Phaeacians, who are returning Odysseus to Ithaca, row during the night and make landfall in the morning. La Venta (18.1 degrees north latitude), in Tabasco, is dated from 1160 BC (destroyed in 400 to 300 BC). Consisting of a fluted pyramid, additional berms, mounds, and plazas in line with this, and buried giant greenstone tile floors representing images of the face of a jaguar, laid out to read "nine" (like in Bolon Dzacab, "Nine Lives"). The site includes four gigantic stone heads, five "creation altars" (a total of 8 giant altars), five elaborate burials. A long site, it is built on an axis of 8 degrees west of north. Malmstrom notes, "The latter feature [aligned 8 degrees west of north] has intrigued archaeologists but has never satisfactorily been explained by them," and proceeds to list some astronomical explanations proposed in the past, none of which hold water. A satisfactory explanation is that the alignment of 8 degrees west of north for La Venta represents a sunset at right angles for February 28th (at 8.6 degrees south of west; 8.2 degrees on March 1). This is the date after the Earth shock by Mars in 747 BC, the day on which the Earth's year increased to the current 365.24 days, and the date on which the Olmecs instituted the Long Count calendar. This is immediately obvious in looking at this alignment. A number of other locations also use the 8 degrees west of north alignment, including the Maya ceremonial center of Tikal, built almost a thousand years later. By that time the use of an 8-degree site alignment had become a traditional aspect of ceremonial center construction. Note that with the Earth's axis aligned 30 degrees to the normal of the orbit, the sunset location for February 28th would not have been at 8 degrees south of west, but at 11.00 degrees. This, in fact, is the angle between La Venta and Popocatepetl. It defines an antipodal sunrise for the day of February 28th in the era before 685 BC. There are two additional alignments with the mountains Citlaltepetl (15.22 degrees north of west) and Volcan La Malinche (15.32 degrees north of west), in direct line with each other, which define a sunset on April 19 (15.27 degrees), for a 30-degree axial inclination. These last two recall the dual alignment used at San Lorenzo for the same era-ending date. But at La Venta this duplication is incorporated by having another volcano, Volcan La Malinche, almost exactly in line (coaxially) with Citlaltepetl -- within 0.1 degree. Not a single one of these mountains can be viewed from La Venta. These two different alignments also suggest the selection and the first occupation of La Venta dates from after 747 BC. This is revealed also by the fact that there definitely is an old alignment for February 28. This was selected while the axial inclination of the Earth was still at 30 degrees. The occupation of the site by farmers, dating to 900 BC, has no bearing on this. Sixty-two years later, after 685 BC, the pyramid and other constructions were started, aligned, as would be appropriate at that time, to 8 degrees off the north cardinal direction in order to again locate the sunset of February 28th. What this suggests is that the location of the ceremonial center incorporated features dating from before 747 BC, but the construction of the ceremonial center which we see today dates to after 685 BC, when alignment corrections were made. All of the iconography of La Venta supports this last. The iconography, in fact, deals exclusively with the event of 685 BC, not the Earth shock of 747 BC. The 15.27-degree north of west alignment (the April 19th alignment) could be held to represent an August 12 alignment in the current era (which would be 15.49 degrees north of west). The age of the site in general, and the site selection alignment to the date of February 28 under the condition of a 30-degree axial inclination of the Earth, argue against an August 12 alignment as an initial condition. When the axis of the Earth changed after 685 BC, the current monumental construction was started, aligned at a right angle to the new horizon location for the date of February 28th. Additionally, the prior alignments to April 19 (as I pointed out above) could then be used as an alignment to August 12. What is missing are any alignments reflecting the events of July of 685 BC. The monuments themselves clearly express what was seen in 685 BC: Jupiter with a giant coma and standing, as it were, on the inverted head of a crocodile, which finds expression in engraved celts and stelae. The apparition in the sky was also understood as a mountain or volcano. This becomes the first pyramid to be constructed in Mesoamerica. "Pyramid" or "man-made mountain" is transliterated from the Quiche, as in Mayan, as "red-house" (Tedlock). Later Post-Classical Maya will express this image, through influences from the Valley of Mexico, as a "Flower Mountain" -- another very appropriate image. Site-identity was accomplished with an alignment with Volcan San Martin Tuxtla in the northwest. With the axis at 30 degrees, the Sun passed directly over La Venta on the Gregorian equivalent day of August 14, setting at 18.93 degrees north of west. In the present era, with the Earth's axis at 23.5 degrees the Sun passes overhead on August 1, 13 days earlier. What we have at La Venta, as was seen also at San Lorenzo, are site alignments serving two purposes. First, the alignment of the setting Sun with a mountain on the day it passes overhead. Second, the alignment of the site with a mountain which recognizes the era-ending dates of the previous creations or re-creations of the world. At La Venta this additional alignment recognized February 28th, 747 BC. The solution of using the axis of a site to point to a horizon location at right angles will be seen again at Teotihuacan, built 400 years later, where it is quite obvious. A thousand years later the Maya use the site axis of their centers and the axis of individual structures for the same purposes. I have no data on axial alignments of most other sites of the Olmec coastal area or the Valley of Mexico, since I lack specific site maps. 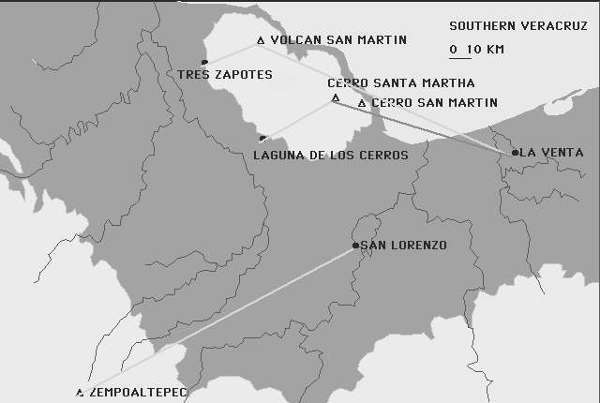 Alignments pointing to April 19, 1492 BC, occur at the Olmec sites of San Lorenzo, La Venta, and Cerro De La Mesas, and can also be implied for Laguna de los Cerros and Tres Zapotes -- all conformed to a 30-degree axial inclination. These also occur at three sites in the Valley of Mexico. At the important site of Cholula in the Valley of Mexico, the horizon location for April 19 is defined under the condition of the current inclination of the Earth's axis. I have looked at site alignments for the additional Olmec sites along the coast, Tres Zapotes, Cerro de la Mesas, Remojadas, Zempoala, and Laguna De Los Cerros. (Nothing interesting was originally found at Laguna De Los Cerros.) I also looked at the Valley of Mexico sites of Tlatilco, Tizatlan, Ciocuilco, Tlapacoya, Cholula, and Teotihuacan. I expected somewhat of a logical progression of alignments among the Olmec sites, and a later progression in the Valley of Mexico. I expected to see the abandonment of alignments for ancient era-ending dates, and an adoption of newer era-ending dates. Nothing like that came clearly to light. What is seen instead is a continued, although somewhat sporadic, use of the alignments for the older era-ending dates (3114 BC, 2349 BC, 1492 BC and 747 BC), some of which almost seemed to have become mandatory, and a genuine confusion of the dates from the year 685 BC. A few notes on some sites follow. Tres Zapotes (18.4667 north; 95.4333 west) Founded sometime in the centuries well before 1000 BC, Tres Zapotes became a regional center after about 900 BC, coinciding with the decline of San Lorenzo Tenochtitlan. Tres Zapotes was completely abandoned by AD 900. The site-identity alignment consists of an angle of 19.67 degrees north of east for a sunrise over Volcan San Martin Tuxtla. This represents the day the Sun passes directly overhead on August 13 of the previous era (before 685 BC), at 19.67 degrees north of east, rising out of a volcano. In addition Tres Zapotes recognizes both July 9th, the day Jupiter expanded in 685 BC, and July 25th, when the plasmoid struck the Sun. The first date with an alignment with Nauhcampatepetl for a summer sunset of July 9th, the second date is signaled with two alignments, one as a sunset over Cerro San Martin, and the other as the antipodal value of this over El Chichon. All of the horizon locations define dates according to the previous axial inclination of 30 degrees. Considering that Tres Zapotes is a very old site, and may have taken over the ceremonial functions of San Lorenzo, it may perhaps be expected to find alignments for the era-ending for February 28, 747 BC conformed to an axial inclination of 30 degrees. But to also find alignments for July 9th, July 25th, and August 12th all conformed to a 30-degree axial inclination, makes little sense if the founding of Tres Zapotes was after 747 BC but before 685 BC. The alignments at Tres Zapotes are complex. We could ask, How did the Olmecs do this? The Olmecs had the Tzolkin calendar and a heightened sense of geography. And they were not primitives. They had lived in these regions for thousands of years. And they had hundreds of years to locate and select sites for ceremonial centers. It is, in fact, only the major ceremonial centers which managed to adorn themselves with all the important alignments. If two mountains could be found which coaxially represented, for example, an era-ending date in conformity to either an axial inclination of 30 degrees or 23.5 degrees, then the line connecting them defines a series of possible sites. A location along this line could be found which might indicate additional important horizon locations. Given a hundred years to do this, and a fine sense of geography, this is not all that difficult. I'll present further details of this site in the next chapter. Cerro De La Mesas (18.7167 north; 96.15 west) "hill of the altars" is an archaeological site in Veracruz, in the Papaloapan river basin. It was a prominent regional center from 600 BC to AD 900, and a regional capital from perhaps AD 300 to 600. The Sun passes overhead on August 12th, which is also the August 12 era-ending for 3114 BC for the era before 685 BC, but there is no mountain at 19.73 degrees for an alignment. There is an alignment with El Chichon (Chiapas) which constitutes an antipodal alignment for a summer solstice sunset in the current era. This is the first instance of a solstitial alignment, but it may be a coincidence. There is an alignment with Volcan La Malinche defining a sunset on April 19, 1492 BC (15.32 degrees), and an antipodal alignment with Cerro Santa Martha (Veracruz), also for April 19 (15.81 degrees), both conformed to a 30-degree axial inclination. Additionally there is a summer sunset over Ixtaccihuatl which defines an antipodal winter sunrise for February 28th, 747 BC (11.04 degrees), also conformed to a 30-degree axial inclination. Here at Cerro De La Mesas we see the first summer solstice, but for the current era. Because all the other alignments are based on an axial inclination of 30 degrees, I think this solstice alignment is a coincidence. There will be two other solstice alignments among the 13 sites, but both will be conformed to a 30-degree axial inclination. Remojadas (18.9833 north; 96.3167 west) is dated from 100 BC to AD 800 (perhaps). The site has remained largely unexplored. An angle of 31.47 degrees north of west with Nauhcampatepetl defines a summer solstice (31.92 degrees) in the previous era, for an axial inclination of 30 degrees. This would be clear evidence of a change in the inclination of the Earth's axis, but I think it is spurious, for all the other alignments are for the current era. A complete array of era markers is presented -- September 8, 2349 BC, February 28, 747 BC, July 9th, 14th, and 25th of 685 BC. All of these are presented under the current condition of a 23.5-degree axial inclination. Zempoala (19.447 north; 96.408 west). Active 100 BC to AD 800. Not well explored. The era marker dates of September 8, 2349 BC, and February 28, 747 BC, and for July 25th, 685 BC, are all presented with alignments based on an axial inclination of 30 degrees. The site identification consists of a zenithal passage on July 26th, although the alignment is also one of the important dates from the year 685 BC. Malmstrom shows six sites with "solstice alignments" in the Valley of Mexico, including Teotihuacan, with alignments to the mountains Ixtaccihuatl, Citlaltepetl, and Popocatepetl. I have checked alignments against the 5 Valley of Mexico volcanoes and 6 coastal mountains. The angle made between any of these sites and the horizon location of sunrise (or sunset) at the solstice would be about 24.9 degrees. None were found. One exception might be the possible solstitial alignment for the prior era when the Earth's axis was still at 30 degrees, found at Cholula, which I think is a coincidence. An August 12 alignment after 685 BC would be about 15.6 degrees. None were found, with the exception of the site-axis alignment of Teotihuacan. There might be other alignments to August 12, determined by the divergence of the major axis of a site from a cardinal direction, but I do not have site plans available. Zenithal passage, between late July to early August, would be at an angle of 19 to 20 degrees. Three were found, including Teotihuacan. What was found instead were numerous "era-ending alignments" -- some 22 for the six sites that were investigated. Teotihuacan (19.683 degrees north latitude; 98.85 west longitude) in the Valley of Mexico, is dated at 150 BC (or 200 BC) and was one of the largest cities in the world, lasting to AD 700, when it was destroyed. The site is offset to the east from directly north by 15.5 degrees. As mentioned above, on July 25th the Sun passes directly overhead. This is an era-ending marker in addition to being a site identity marker. 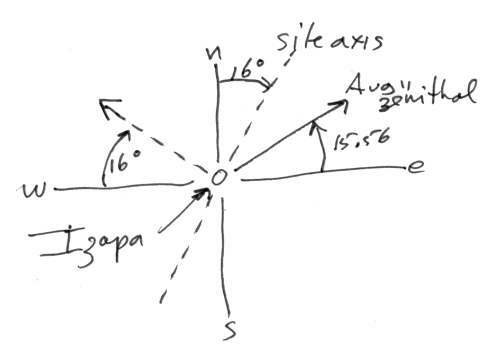 Anthony Aveni claims, in Skywatchers of Ancient Mexico (1980), that at Teotihuacan the Pleiades set at "about" 15.5 degrees north of west after culmination, and in circa AD 150, which would be at a right angle to the Street of the Dead (the main axis of the site). "To a degree," writes Aveni. This is not even nominally correct, for the date of AD 150 is too early, and the angle is off by 3 degrees. It is not a 15.5-degree normal to the main axis. I have identified the existing right angle as an August 12 alignment. The main street is clearly oriented at a right angle to an August 12 sunset location (15.6 degrees north of west). The Temple of the Sun at Teotihuacan forms one side of a giant ballcourt with the horizon location where the Sun sets, on August 12, forming the other side. The Sun is the ball or perhaps the ball player, on August 12. The site is additionally oriented to a winter sunrise over the near mountain Citlaltepetl in the southeast (which cannot be seen from Teotihuacan). This angle with Citlaltepetl, the highest mountain in Mexico, suggests an antipodal sunrise on July 15th (22.83 degrees), and may represent the day after July 14th. As mentioned above, there are two antipodal alignments to Volcan San Martin Pajapan (18.65 degrees) and Cerro Santa Martha (Veracruz) (18.45 degrees). Both reflect an alignment for the setting of the Pleiades after culmination on October 20 or 21, Gregorian. Curious as this might seem, there are many antipodal alignments to be found at other sites, as at Teotihuacan. This type of alignment has been remarked on by archaeologists (who normally pay little attention to things like this). Considering the twist in geometry which is accomplished by having the right angle direction of the main axis at Teotihuacan point to an important horizon location, the use of antipodal alignments is not unexpected. Antipodal alignments were first used at the oldest site in this region, San Lorenzo, discussed above. The antipodal alignment in this case points in the direction of the angle below (south of) the east-west direction which is equal to the proper angle above the east-west direction. It thus points to a summer sunset in the reverse direction (and two for the setting of the Pleiades). There is no solstitial alignment at Teotihuacan. Monte Alban used a fixed Tzolkin calendar, starting on August 14, which repeated a smaller portion after the first 260 days. This was related to Malmstrom by archaeologist David Peterson working at Monte Alban. The site's axis angle of 5 degrees east of north is at a right angle to a sunset on the day of September 8 (5.16 degrees sunrise) for the period after 685 BC. 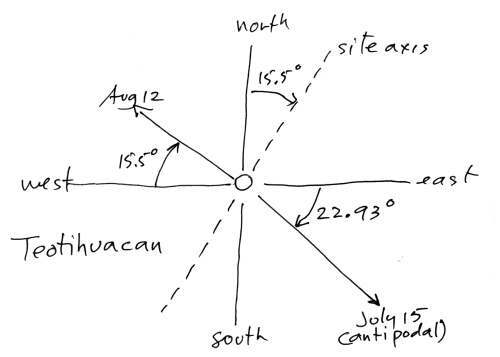 There are many alignments for the date of September 8 among Olmec sites and in the Valley of Mexico, both for the current 23.5-degree axial inclination and the prior 30-degree axial inclination. September 8 is an "era-ending" horizon location for 2349 BC -- the "Day of the Dead." It signifies the day of the culmination of the Pleiades in the era before 685 BC, when the axis was still at 30 degrees. Rebuilding the site in about 275 BC, from an alignment of 15.5 degrees east of north to an alignment of 5 degrees east of north, was a rejection of the Olmec philosophies, and a return to older, and perhaps local and more correct, traditions. Monte Alban was the longest-lived ceremonial center in Mesoamerica, lasting 1700 years until taken over by the Mixtecs in about AD 1100 (to continue an additional 400 years). There are some groupings of alignments which do not correspond to known dates or easily assigned dates. Any alignment can generate four separate dates, two in the spring and summer, and two in the fall and winter season. Alignments at angles of 27 to 29 degrees are associated with 6 sites, but no consistent dates show up. The data follows. All the calculations are for an axial inclination of 30 degrees, since these angles would be out of range for an axial inclination of 23.5 degrees. It might be that the dates of July 17 and July 18, and even July 20, were meant to indicate the date of July 14th, as used at other sites to represent the release of the plasmoid from Jupiter. It could be suggested, for example, that local records of the event were divergent in determining the actual date, since this was an event which took place in the far reaches of space, and might not have been seen accurately. On the other hand, the alignments at 27 to 29 degrees are probably all spurious. None of the sites duplicate these horizon locations to have two mountains fall in line for an alignment (a coaxial alignment), as happens frequently at many locations. The following are four sites with 13-degree alignments, all with alignments are within 0.3 degrees of 13.1 degrees. All the alignments point to the southeast or the northwest, and all four sites use coaxial alignments. But the dates make no sense in terms of expected sunsets on important dates. Below are the sites with 18-degree alignments: These five additional sites have seven alignments grouped within 0.4 degrees of 18.6 degrees, all oriented along southeast to northwest axes. The "possible dates" listed above are for horizon locations of sunsets and sunrises. None of these make any sense, not even in terms of being off from some likely era-ending date by one or two days. The alignments must have had some importance, for two are coaxial and all point to the southeast or northwest. What finally clarified these two sets of alignments was the realization that rather than representing sunsets, these two sets represented the setting of the Pleiades after a culmination in the fall of the year. I have already presented this for the city of Teotihuacan under a discussion in Chapter 21, as the "Day of the Dead." I suggested earlier that the commemoration of the "Day of the Dead" was likely initiated by the very influential site of Teotihuacan, and was codified to a calendar date (day of the seasonal year) after AD 200, when Teotihuacan was founded. The celebration remained located at the same (Gregorian) date of October 20th, into the Spanish era after AD 1550. With the introduction of Catholicism, it was moved to November 1st and 2nd. The five sites using an 18-degree alignment (for the AD 200 to 400 era) are all located in the Valley of Mexico. This represents five of the six sites I looked at. The celebration, of course, recalled the event of 2349 BC, what the Maya called the end of the "third creation" and we call the "flood of Noah." The angle north of the west cardinal direction, where the Pleiades set, only slowly moved further north. Similarly, the culmination increased its height at Teotihuacan until at about AD 700, when Teotihuacan was destroyed. At that time the Pleiades passed directly over Teotihuacan at midnight (for what that anecdote is worth). San Lorenzo has no such alignment. Besides the Olmec sites of Tres Zapotes and La Venta, two additional sites in the Valley of Mexico also use this alignment, Tlatilco and Tlapacoya. 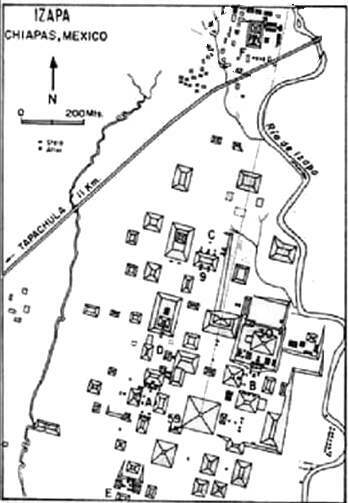 Tlatilco was apparently an Olmec outpost, and Tlapacoya also shows strong Olmec influences. Both are quite old, first occupied after 1500 BC. Both have alignments conformed to an axial inclination of 30 degrees. Strangely, Tlapacoya also has an 18-degree alignment, but not an alignment for April 19th. The first thought would be that the alignments (for an axial inclination of 30 degrees) of 16 to 17 degrees should be combined with 15.3-degree alignments for the era-ending of April 19, 1492 BC (as Malmstrom and Aveni would have been likely to do). There are seven instances of alignments between 16 and 17 degrees, of which I have identified two as representing an alignment other than the setting of the Pleiades. The remaining five are distributed over three sites, one at Laguna De Los Cerros and two at Tres Zapotes, both in the Olmec coastal region, and two at Tizatlan in the Valley of Mexico. The directions of the alignments are coaxial at both Tres Zapotes (pointing northwest), and at Tizatlan (pointing southeast). The multiple alignments at two of the sites indicates that the alignments may have been significant. Since the alignment at Laguna De Los Cerros breaks the tie as to whether spring/summer or fall/winter dates should be used, I will select a spring/summer date. All three sites are quite old. Laguna De Los Cerros was settled between 1400 and 1200 BC; Tres Zapotes dates from before 1000 BC. The solution here too, is to suggest that these alignments do not point to a date (which could be April 21) but to the setting of the Pleiades in about 100 BC. This would have been at 16.7 degrees north of west (this is marked on the chart of the Pleiades culminations above). Tres Zapotes has alignments for February 28, 747 BC, and for July 9 and 25th, 685 BC, and additionally an alignment for a zenithal passage of the Sun on August 13th -- all conformed to a 30-degree axial inclination. Adding four alignments for the setting of the Pleiades, two for a date of 685 BC to 600 BC and two alignments for about 100 BC, salvages the unexpected lack of earlier era-ending alignments. But note that the setting of the Pleiades is conformed to a 23.5-degree axial inclination. That means it was developed after 685 BC -- in fact, probably in about 100 BC. At Tizatlan there already exists an antipodal alignment for the date of April 19, 1492 BC. We can now suggest two additional alignments for 2349 BC, as the setting location of the Pleiades in about 100 BC. Tizatlan also has an alignment for July 14th, conformed to the era before 685 BC. At this point we have a great number of instances which can be identified as marking the culmination of the Pleiades. The sequence should point to a history of the ceremonial centers. But of course old forms can reused, and established forms can be used long after their earlier occurence. The codification of the "Day of the Dead" by Teotihuacan in circa AD 200 or 400 lasted to AD 1550. So the list should be used carefully. Below the list of Pleiades culminations is reproduced, with various sites inserted as appropriate. -- The entry "original" can be used for all years before 685 BC. I should point out that September 8 was a hard and fast date before 685 BC, to mark the setting of the Pleiades at the break of day, as it had for all the time prior to this date in September of 685 BC. Directly after the nova event of 685 BC, because the dome of the stars moved with respect to the horizon, the Pleiades culminated on October 8th. The corresponding sunset location for this date was used by four sites (with Zempoala using September 8th). An equal number of sites used the alternate setting location of the Pleiades after 685 BC instead of the sunset location for that day. By October the setting of the Pleiades (284 degrees azimuth) and the setting of the Sun (264 degrees azimuth) no longer corresponded. I suspect that La Venta initiated this use of the setting location of the Pleiades, and Tres Zapotes in the Olmec area followed, followed in turn by two Valley of Mexico sites, Tlapacoya and Tlatilco. The corrections of circa 100 BC seem to have been initiated by Tres Zapotes, which may have recognized the significance of this horizon direction which had already been available to Tres Zapotes for 600 years. It may indeed have been accepted by Tizatlan, but finding this horizon location at Laguna de los Cerros may be accidental, since Laguna de los Cerros has no other alignments except two suspicious looking alignments of July 14 -- two of them, coaxial, with one antipodal. It is also obvious that after AD 200 the city of Teotihuacan imposes the latest correction, setting the celebration of the culmination of the Pleiades to October 20 or 22. This is accepted by 4 other sites in the Valley of Mexico, but not in the Olmec region. October 20 remains the accepted date for the "Day of the Dead" until AD 1550, after which the Catholic Church moves it to coincide with All Souls and All Saints days in November. Altogether with the initial sunset location representing October 8th, and with numerous changes and corrections over the course of about 900 years, there are 25 alignments celebrating 2349 BC. Below is a summary by the era-ending dates. I have excluded Izapa near Guatemala, Edzna in the Yucatan, and Monte Alban in Oaxaca, which were discussed above, but which were not tested against other local mountains. Both the Olmec sites and the Valley of Mexico sites are listed from south to north in two groups. Zenithal alignments are also listed below. How good are these statistics? I have compared 13 sites (not counting Izapa and Edzna) with 11 mountains and found 70 coincidences (plus three questionable values), all falling within a third or a half of a degree for the dates listed above, counting alignments for a zenithal passage only once. Consider that, if there were no attempts to line up sites with significant mountains, the alignments would have been randomly distributed over 365 days. Instead, 52 of the sunset alignments fall on 6 days in two eras of differing axial inclination, thus on a total of 12 days. Twenty alignments to the setting of the Pleiades fall on three dates. What if some of the alignments were assigned to the incorrect date? This might be suggested for alignments close to 15 degrees, which I have assigned to an April 19th date under the condition of a 30-degree axial inclination. These would then be added to the alignments for an "August 12" date under the current axial inclination of 23.5 degrees -- for a total of 11 alignments assigned to August 12th. There would still be 70 coincidences. Alignments for various era-endings at 30- and 23.5-degree inclinations. August 13, 3114 BC ? I found only one solstitial alignment for the current era, at Cerro de la Mesas. But it might be suggested, similar to the above, that any of the alignments close to 25 degrees, now assigned to July 9th (23.5 degree axis), should all represent solstitial alignments -- a total of 9 solstice alignments, all assigned to the current era. There would still be 70 coincidences. I doubt if either of these possibilities is an error. I think what is most convincing of the reality of these alignments as era-ending markers, is the frequency of occurrence of the 1492 BC date of April 19th -- 16 instances -- and the 747 BC date of February 28th -- 10 instances. These occur first at the two oldest sites, San Lorenzo and La Venta, for the condition of an axial alignment of 30 degrees. Even more convincing, is that in addition to the four instances of alignments pointing to October 8, 2349 BC, which are listed above, an additional 20 alignments can be assigned to the setting of the Pleiades after culmination. For every one of these 13 sites, there are 11 possible mountains to test for significant alignments. Thus there could have been as many as 11 significant alignments. But three alignments per site is the average. 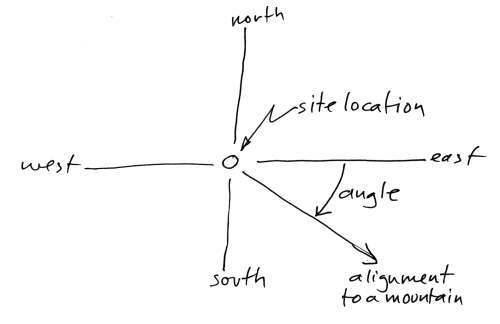 Five of the 11 sites use three alignments. Away from the average, two sites each use 2, 4, or 5 alignments, one uses one, one uses six. Here I am not counting alignments for the zenithal passage of the Sun, or the setting of the Pleiades. Among the sites tested there is obviously disagreement over the date on which the most recent era ended. The changes in July of 685 BC were confusing. But the world had definitely changed. The question was, did the previous era end on July 9th, when Jupiter showed himself again, on July 14th, when he released a plasmoid, or on July 25th, when the plasmoid landed at the Sun? There are 22 alignments which make attempts to establish a date for the era which ended or changed in 685 BC. To the possible dates which could have been used, we must add August 12, which is the equivalent calendar date of July 26th between the two eras. At any latitude within a degree or so to 19 degrees north, the sunset for August 12 when the axial inclination was 30 degrees, is within a half degree of being identical to the sunset for July 26 for an axial inclination of 23.5 degrees. This identity has no utility, however. Each of the dates of the year 685 BC was selected an equal number of times, except that July 25th was selected 7 times, and the alignments for the dates were as readily "assigned" to the era before 685 BC of the 30-degree axial inclination, as after. Final agreement was probably reached under the hegemony of Teotihuacan, after 200 BC. It is also clear that almost all sites picked either to align their important era-ending dates to an axial inclination of 30 degrees or an axial inclination of 23.5 degrees. Only a few sites (Cuicuilco and Tlapacoya) mixed alignment for different axial conditions as convenient to the mountains or volcanoes which could be used. La Venta stands out as an example of a site caught in the midst of the change of the axis in 685 BC, which was resolved by creating a new alignment through a reconstruction of the site. This reconstruction (and also the later massive rebuilding of Monte Alban) demonstrates how important these alignments were. At this point we have a great number of instances which can be identified as marking the culmination of the Pleiades. The sequence should point to a history of the ceremonial centers. But of course older forms can be re-established, and older forms can remain in use. The codification of the "Day of the Dead" by Teotihuacan in circa AD 200 or 400 lasted to AD 1550. So the list should be used carefully. Earlier the list "Culminations of the Pleiades" is reproduced, with various sites inserted as appropriate. The general history of the course of events seems to have run as follows: San Lorenzo was the first site to use both a zenithal alignment and alignments for a certain date in the past, in fact, for a date prior to the founding of San Lorenzo which represents, as we know from Eastern Mediterranean sources, the calendar date of the Earth shock preceding the Exodus of Moses. All the Mesoamerican sites I have looked at, with rare exceptions, also institute alignments to the horizon location of the setting Sun for this date in 1492 BC. In the following chapter, "The Day of Kan," I will show that the tradition started at San Lorenzo had its genesis in similar activities in the Soconusco region of Guatemala at an earlier time. The tradition was one of assigning "primacy" to a single site in a region for a certain period. "Primacy" allowed the site to dispense lordship to other sites, offer the insignias of power, and provide copies of the "Books." The Popol Vuh has repeated references to this for the lords of the Guatemalan sites of the Quiche. Primacy passed to Tres Zapotes, after it was terminated at San Lorenzo in about 900 BC, but Tres Zapotes was devastated by some calamity, at which time primacy passed to La Venta. La Venta was established after the Earth shock of 747 BC and the change in the length of the year. It was La Venta where the Long Count was initiated, and thus the book called "the Council Book." Within a hundred years La Venta was caught up in the change of the Earth's axis of 685 BC. The site was rebuilt to a new central axis, aligned at a right angle for the new horizon location representing the date in 747 BC. All later sites in the region also added this alignment. The Long Count allowed retrocalculating the date of the end of the "second creation" of 3114 BC, August 12 or 13, and the date of the end of the "third creation" (Noah's flood) of 2349 BC, as the setting location of the Pleiades. A number of sites also add the setting of the Pleiades in (after) 685 BC as an alignment, like Tres Zapotes, Tlatilco, and Tlapacoya. Tres Zapotes is Olmec, the other two sites are "Olmec influenced." Tres Zapotes adds this initially as October 8, like La Venta, reflecting a setting location for the Pleiades shortly after 685 BC, then two more alignments are added for a setting location at about 100 BC. As a result it could be suggested that the celebration of 2349 BC was probably instituted at La Venta as the horizon location of the setting of the Pleiades after culmination. It should also be obvious that an interest in the event of 2349 BC was probably initiated with the return of Jupiter which was witnessed in 685 BC, duplicating the earlier return from the dead of Jupiter in 2349 BC. The alignment for 2349 BC was adopted by other Olmec sites. The alignments previously established at La Venta for the dates of 1492 BC and 747 BC remained, although they were no longer valid. As mentioned above, for 747 BC a new alignment was established. But more important, the Long Count and the "Council Books" provided a record of actual dates in 685 BC which could be claimed as significant in recording how the Sun "left its path" and returned, and how Jupiter saved the world from destruction. The dates show up as various later alignments, and are specifically referenced five times in the Maya Chilam Balam (most as intervals). When the period of primacy for La Venta ended (in 334 BC), it passed back to Tres Zapotes, or may have gone elsewhere, possibly to Monte Alban. It was at Monte Alban that an ideographic script was devised which would have been used to elucidate the "Council Books" and the other books of ancient history (mentioned in the Popol Vuh) which in turn allowed access to the information by other tribes. In AD 224 primacy passed to Teotihuacan which held it until circa AD 700. Teotihuacan was enormously influential, and spread its doctrines (concerning alignments) into all of the Valley of Mexico, back into the Olmec coastal region and the Yucatan Maya region, as at Edzna. Teotihuacan redefined the celebration of the "Day of the Dead" to the then current horizon location of the setting of the Pleiades in AD 200 or 400. This date remained in use into the Spanish era, 1200 years later. From Monte Alban and Teotihuacan the information of the past was promulgated to other tribes, so that there was a choice of what significant alignments could be used for any location. I'll provide additional historic details, as it can be gleaned from alignments and sculptures, in the chapter "The Day of Kan."
The single solstitual alignment in the current era was for Cerro De La Mesas (24.90 degrees n of e, antipodal). I also found two suspected solstitial sunsets for the previous era, Remojadas (31.92 degrees n of w) and Cholula (31.94 degrees n of w). At Cerro De La Mesas all 5 other alignments are for the previous era. At Remojadas all 5 other alignments are for the current era. At Cholula six other alignments are for the current era. Since none of these solstitial alignments match the era for the other and more frequent alignments of these sites, I feel safe to dismiss all of them. We cannot speak to most of the religious practices of Mesoamerica which first show up in Olmec times, in 1500 BC to 400 BC, for we do not know what they involved. However, we can penetrate some of the symbols left behind. The cloud altars, the giant stone heads, the jaguar images, and the jaguar babies can all be explained in reference to celestial planetary phenomena. Close passes of Mars in the 8th century BC would have brought hurricane winds and tides to the neck of Mexico where the land is less than 150 miles (240 km) between two oceans. Giant continuous lightning bolts were also experienced, although much further north. Mars was perhaps represented by the bat-image Jaguar, and a source of supreme terror. After 800 BC, I would expect that Mercury was the "Jaguar Baby." However, a "presentation" scene of a were-jaguar infant spread on the lap of an adult is seen also at San Lorenzo, carved into an altar, and thus probably dating to before 900 BC. As such, the "Jaguar Baby" might represent an earlier appearance of Mercury and Mars starting in about 1935 BC. The inclination of the Earth's polar axis (with respect to the normal of the orbital plane) shifted from 30 degrees to 23.5 degrees in 685 BC. Names of Katuns in the rotating 13 Katun series are named after the last day of the Katun. For the Katun ending after 685 BC (astronomical, Gregorian) this is 3-Ahau (6.4.0.0.0). The actual calculation finds the difference in Gregorian calendar days for 14 Tzolkin periods. This is 12.4 days, and matches the change in the Gregorian calendar for a setting sun of a zenithal passage for the latitude of Monte Alban or La Venta. The rising or setting Sun moves only by small increments along the horizon from day to day as the summer (or winter) solstice is neared. With the passage of each day before the solstice the Sun rises at a lesser fraction of a degree north of east. It takes 16 days to move the last degree. This much movement would, however, have been noticed, for the Sun would have moved two Sun diameters. I think eyeball sightings can be much closer than two degrees. A finger held at arm's length subtends one degree, which is twice the width of the Sun. The reason for selecting alignments was religious and not intended as a demonstration of priestly skills at geometry or its use as the basis for calendar recalculation. But the measurements are in fact very close -- often within a quarter of a degree, and seldom as far off as a third of a degree. We know that the calendar was never ever recalculated. The sloppiness allowed by Malmstrom contradicts his suggestion that the alignments were needed for calendar calibration. It might be suggested that Malmstrom meant that stepping away from the center of a ceremonial center would not move the sunset location by more than 2 degrees. This might be true for the Maya ceremonial center which used sightlines to nearby structures, but for Olmec ceremonial centers, which were located many miles from the target mountains, this could not be true. Consider stepping sideways by 20 feet from the sightline to a mountain which was located 20 miles away. The angle of view would not change by more than 1/100th of a degree, arctangent(20 / (20 * 5280)) = .010 degrees. The mountains used for alignments were often 100 to 200 miles away. One would have to move a mile away from the center of the ceremonial center to reach a mismatch of a half degree if the mountain were 100 miles away. In Cycles of the Sun, Mysteries of the Moon (1997), Malmstrom remarks on the observations of Venus in Mesoamerican Maya and Mexican records, and notes that it is easier if the Mesoamerican (Tzolkin) calendar is used. He records the periodic rising of Venus out of the volcano Orizaba (Citlaltepetl) east of Cholula in about AD 830 to AD 1454 (the period of investigation by Malmstrom). In a later paper, "The Role of Venus in Mesoamerican Calendrical Origins" (nd) (at http://www.dartmouth.edu/~izapa/Venus.html), Malmstrom argues for a start of the Tzolkin calendar in 1359 BC at Izapa, coinciding with a heliacal rising of Venus "over Volcan Tajumulco" at 66 degrees, 35 minutes azimuth (23.4 degrees north of east). He also suggests that the 365-day Haab calendar came into existence a few decades later at Izapa, with the heliacal rising of Venus in 1324 BC, at 22.41 north of east, "nearly over Tajumulco." Let me point out that this rising of Venus "over" or "nearly over" Volcan Tajumulco is off by 7 degrees -- nearly two hand-spans at arm's-length. That is not "nearly." Additionally, the skies and the year were radically different in 1359 BC (although Malmstrom would not know this), so that retrocalculations using today's parameters will not yield sensible results. I have already established that the Tzolkin originated in its present form on September 6, 2349 BC (Gregorian equivalent). The original Haab (360 days) dates from April 19, 1492 BC (Gregorian equivalent), and the modified Haab (365 days) dates from February 28, 747 BC, as has been detailed in a previous chapter. There are some considerations with respect to the inclination of the Earth's axis (discussed in Appendix "Change in the Axis") which might affect this data, although mostly the impact remains the same. I originally assigned the angle of 6.6 degrees to April 2, but it was not supported by anything except the possibility that perhaps the blazing of Venus started on this date. It also does not fit the Mesoamerican notion of celebrating the concluding date of events, and not the starting date. Since any angle above or below the east-west axis can generate four calendar dates, the next guess was September 8th. This made much more sense, because it would reflect the second day after the fall equinox. The equinox before 685 BC fell on September 6th. Since September 8th was the night when Jupiter had returned from the dead, and the Pleiades would reach culmination, it was a short reach to suggest that this was probably the commemoration of the closing date of the "third creation" in 2349 BC -- the celebration of the "Day of the Dead". This also solved the problem of why there were otherwise very few sunset alignments for this date. After 685 BC the culmination of the Pleiades, as a celebration of the return of Jupiter from the dead, immediately moved to October 8 (September 21 plus 2 days plus 15 days), and then started to drift further into the fall season with the precession of the equinoxes, which had started in 747 BC. Almost everywhere in the world, it is the culmination of the Pleiades at midnight which marks the "Day of the Dead," not a calendar date. Thus the reason there were few alignments corresponding to a sunset for a date of September 8th (before 685 BC) or October 8 (after 685 BC) is due to the fact that the sites changed to marking a setting of the Pleiades rather than a setting of the Sun -- at some sites for the date of October 8th, representing the setting location directly after 685 BC, and at other sites for the date of October 21 or 22, representing the setting location in about AD 200 to 400. This accounts for 15 "2349 BC" alignments among 9 of the 15 sites. The calendar date of October 21 or 22 was apparently set by Teotihuacan, and was still in use 1300 years later when Cortez met up with the Aztecs. There are also five sunset alignments (rather than the setting of the Pleiades) for September 8th to signal the culmination of the Pleiades before 685 BC. 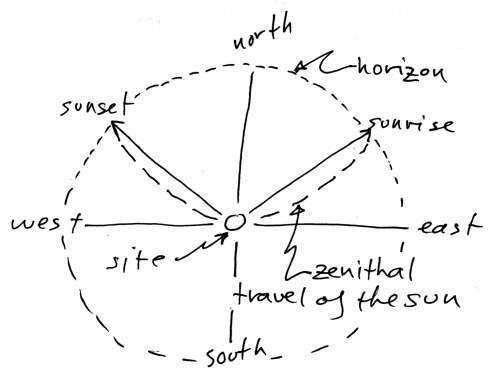 Anthony Aveni, in Skywatchers of Ancient Mexico (1980), assigns the invention of the 260-day Tzolkin to the site of Copan, located at a 14.85 degrees north (similar to the latitude of Izapa), where the Sun overpasses the site on August 13, and again 260 days later on April 30. Copan as the source of the Tzolkin seems even more unlikely than Izapa. A look at a table of latitudes and zenithal dates, reproduced in the 1979 book by Malmstrom, has August 13 missing. Yet this is followed immediately with the statement "The zenithal sun makes its southward passage over latitude 14.8 N on August 13." As can be seen from the above, my calculations for each of the three latitudes are late by a day. Thus, although I assign "August 11" to Izapa, it may be August 12. But it is not August 13. I am using a latitude of 14.90 degrees north (established by others and published). By comparison, Malmstrom uses a latitude of 14.8 degrees. This inches the overpassage close to August 12, but not August 13. The difference between 14.9 and 14.8 degrees of latitude represents a difference of about 7 miles (11 km). The site, which is spread over a long swatch of land running from SSW to NNE, is only 1.4 miles (2.25 km) in length. Use of a latitude of 14.4 degrees north would have guaranteed the date of August 13, with the Sun reaching 89.99 degrees above the horizon. But that is a location 39 miles (63 km) further south. I have noted in previous text that the surpluses of maize from a single farming family could feed 20 additional people for a year. These surpluses were put to use to build, expand, and maintain ceremonial centers. It is a process which could have easily expanded from the communal support of a single shaman (or "day-keeper," as they are called today). The growth of ceremonial centers was voluntarily supported by the population, for the benefits were visible and obvious. Of greatest benefit would be the fact that the surpluses, which would normally be used for a labor force and trade contacts benefitting the ceremonial center, could be used to sustain the citizens through years where unexpected frost or lack of (or excess) rains would have destroyed crops and caused a famine which an individual family would not have been able to endure. The agricultural surpluses are also key to understanding the abandonment of sites. If a drought or other adverse climatic conditions lasted three years or more, a farming family would move away to find a better environment, for the support from a ceremonial center could not be extended indefinitely. With the severe social strictures in Mesoamerica against the accumulation of wealth, a relocated farmer would also have cut down his planting to just cover the needs of his immediate family. The same results would be seen if the shamans, for whatever religious reasons, abandoned a ceremonial center. The farmers who remained behind would also cut back maize production, both for social reasons and because no one wants to do unneeded farming. When I use the phrase "Gregorian equivalent," it should be realized that for years before 747 BC this represents spreading the 365.24 days of our current Gregorian calendar over 360 actual seasonal days, and without allowances for leap days. There are 44 volcanoes in Mexico, 40 of them on the mainland. The list of mountains and volcanoes, which I have used to check alignments in the Valley of Mexico and the Veracruz region, have excluded volcanoes north or west of Paricutin Cono (19.46 n, 102.2 w). "One perplexed writer suggested that the Mesoamerican Olmecs aligned their structures with the Big Dipper. When neither the north-south axis nor the solar behavior nor a constellation fits the orientation, then it is that the ancients could not tell directions well, or that the matter in any case was not important to the builders." "What is absent from such reasoning? First, there is a failure to appreciate that the desire to orient to the skies was an obsession, a compulsion, an inescapable tradition, a sacred obligation, a proud duty. Second, the ancients, as far back as we can discover their humanity, could calculate readily and exactly the course of heavenly bodies and orient themselves thereto. Many examples of this are presented in de Santillana and von Dechend's book, Hamlet's Mill." The zenithal sunrise of August 14 (18.93 degrees s of e) for before 685 BC, could also be used to point to the era ending date for 3114 BC (19.36 degrees n of w). But I doubt if that was so. Although the ending (day 13.0.0.0.0) of the previous era could be found by retrocalculation, the fact that it would represent August 13 of 3114 BC (4-Ahau 8-Cumku), suggests that a 365.24-day year would have been used. It is an unlikely mistake to be made directly after 747 BC, when the Olmecs certainly would have known that the year previously was 360 days, not 365.24 days. Aveni also claims the Pleiades would have risen heliacally on the first day of the zenithal passage of the Sun, which would be May 17 (the second passage is July 25). Aveni has May 18th. But for Mexico City in AD 150, on May 17, the day the Sun passes overhead, the Pleiades stand at an altitude of 19.5 degrees above the horizon as the Sun rises. They do not rise with the Sun (that is, heliacally), as Aveni claims. I have April 22 for the heliacal appearance of the Pleiades. I used the location of the Pleiades for Mexico City. This can be done because the difference in latitude between Mexico City and Teotihuacan is 0.267 degrees, resulting in a change in the setting location of the Pleiades along the horizon of only 0.26 degrees. Aveni's book contains a lot of erroneous data, including calendar dates and horizon azimuthal measurements. For my purposes, an alignment which is off by one degree is totally unacceptable. As noted, I am generally holding alignments to 0.3 degree. "Peterson also notes that the side walls of one of the oldest structures at Monte Alban, Mound K, are oriented to the sunrise positions on March 9 and October 5, which he suggests reflects the Zapotecs' method of defining a 52-day interval before and after the zenithal sun passages at Izapa." I think this has nothing to do with Izapa. It is just unlikely that a location of such importance and independence as Monte Alban would have anything to do symbolically with the remote site of Izapa. The "52-day interval before and after the Izapa zenithal" is 53 days after August 13 (for October 5), and is 51 days before April 30 (for March 9). Because I have not seen these dates in use elsewhere, I cannot attach any significance to them. It is possible that they show up in the Peten, where Monte Alban might have had a larger influence. Anthoni Aveni, in Skywatchers of Ancient Mexico (1980), mentions (from the research of others) that a staircase of Building J aligned with Capella in about 250 BC, but notes that Capella's heliacal rising would have coincided with the date of the zenithal passage of the Sun. 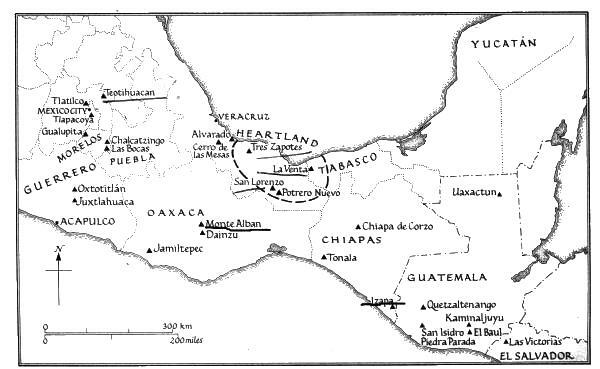 Alfred de Grazia, in The Lately Tortured Earth (1983), references Anthony Aveni, in Archaeoastronomy in Pre-Columbian America (1975), as claiming that many sites in Mesoamerica are oriented about 17 degrees east of north, mostly in the Valley of Mexico. He includes Teotihuacan, Cholula, and Tula and some buildings at Chichen Itza in the Yucatan. But the axis of Teotihuacan is oriented at 15.5 degrees east of north, not 17. Aveni also claims that the site orientation of 50 out of 56 sites he investigated (including Peten sites) were aligned east of north, and claims that Olmec sites are oriented 7 or 12 degrees west of north. None of this makes much sense, and most of it is dead wrong. 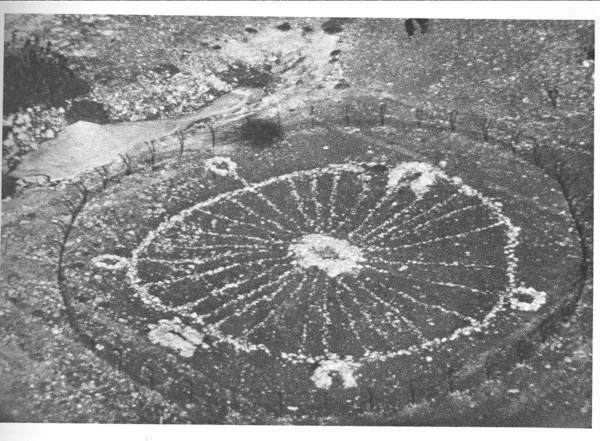 This is discussed further in an endnote to the chapter "The Day of Kan."
Similarly the markers outside of the circle of the Big Horn Medicine Wheel in Wyoming are assigned by Aveni (1975) to the summer and winter solstice, plus the rising of the stars Rigel, Sirius, and Aldebaran. We can be sure that these exterior markers were placed in more recent times. But a count of the number of lines radiating from the center of the wheel reveals 28 spokes, which places its original construction to before 3147 BC. The exterior marker which is removed away from the circle is today aligned with the summer solstice, but would also have pointed to the contact with Saturn in the North Atlantic. Some of the alignments determined by archaeologists seem far-fetched in that some are taken across the center marker, and some across two exterior markers, sometimes through the centers, at other times along the edges. I am reminded of Gerald Hawkins, who, in Stonehenge Decoded (1965), found 165 alignments at Stonehenge with the rising and setting of the Sun, Moon, and various stars. See also Martin Doutre's analysis of a mass of stones at Waitapu in New Zealand, at http://www.celticnz.co.nz (a local copy at [othergroup.net/waitapu.php]), a spoof which will move the science of ancient alignments far into the future. The Zapotec script has been deciphered. (See Javier Urcid Zapotec Hieroglyphic Writing (2001).) Urcid points out that it dates from about 600 BC, and is primarily ideographic. Size of this page: 26165 words.